​As is the case with any sport, for every winner, there's always a loser and inevitably, someone will get the better of you. The same rule applies on the basketball court. Sometimes, you're the one with smooth crossover and sometimes you're the one whose ankles are getting broken. In the case of the poor guy in the white uniform, he was the latter. The only thing that could be worse than getting your ankles broken by a crossover is having to get helped back to your feet by the guy that crossed you. However, for the ball handler in the dark grey uniform, it likely wasn't done out of disrespect, but rather out of genuine concern. After crossing up the defender (#23), the ball handler (#2) pauses for a second before realizing that he already got the guy and that there was no need to try and embarrass him any further. In any case, #2 showed exemplary sportsmanship. Though the game got stopped (for unknown reasons), it was still a noble gesture in noticing that his defender was already beat and took a bit of a bump in the process. Rather than blow past him for a basket, #2 instead offered a helping hand to make sure #23 was okay. 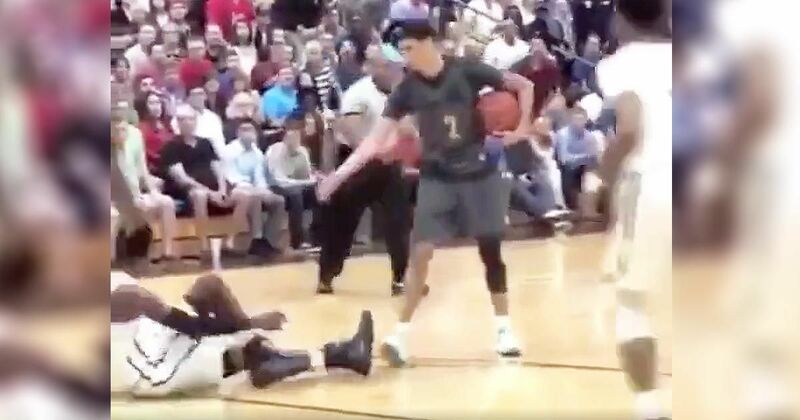 Baller Helps Defender Up After Breaking His Ankles! I guess he felt bad about breaking the defender's ankles.